English travelers go abroad on holiday and to conduct business, so UK residents hold a strong stake in the future of regional travel. Although Brexit may cause minor hiccups, the travel industry is expecting holidaymakers and work travelers to continue moving freely between the UK and the EU, following the March Brexit date. If travel industry observers are on target, Brexit uncertainty won’t interfere with your holiday planning. And if your business relies on travel to the EU, your progress isn’t likely to be slowed. With a wide array of desirable travel destinations within reach, Britons enjoy privileged access to some of the world’s most sought-after spots. For adventurous UK holidaymakers, willing to extend their travel reach, distinct global destinations make the list of possibilities even longer. 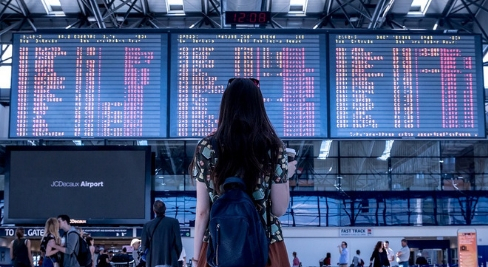 Whether you’re traveling soon or just starting to plan a trip, consider these top spots and protect your travel investment when EU flights are cancelled or delayed. Travel writers and leisure experts are quick to identify their favourite travel destinations and activities. An overview of top spots contains popular attractions found across the world, appealing to adventure-seekers, leisure travelers, and fans of natural beauty. Leading holiday destinations include these worthwhile discoveries. Heart of Wales Railway Line – You don’t have to travel far from home to enjoy this noted attraction. The line picks up south of Shrewsbury, in a small town called Craven Arms. The railway runs south-west through the beautiful country landscapes of Wales. The 120+ mile line has been in operation since 1868, and a footpath project, scheduled for March, 2019 completion now enables visitors to closely follow the train’s route on foot. Elos, Crete – One of several traditional mountain villages on Crete, Elos is widely known for its annual chestnut festival. The Greek village’s lush surroundings include hiking trails and prized tavernas. For a full dose of local flavor, partake of traditional raki with honey after a day enjoying the sights and hospitality in the welcoming mountain town of Elos. The drink is distilled from grapes and then flavored with aniseed, producing a distinctly herbal Mediterranean alcoholic experience. Leiden, Netherlands – Leiden in South Holland provides a picturesque backdrop for walking, shopping, and sampling local fare. Located near The Hague, the shopping district is home to artisanal bakeries and cheese shops, as well a clothing boutiques, and art galleries. The ethnographic museum shop adds another attraction to this canal cloaked Netherlands destination. Pamporovo, Bulgaria – Looking for a prime winter holiday destination? Skiers appreciate this resort, located just three hours from Sofia. Nestled in the Rhodopi Mountains, Pamporovo winter recreation also includes snowmobiling and dog sledding. The resort offers skiing for various skill levels; its facilities and instructors are highly rated. The cost of airline tickets represents a substantial piece of your holiday travel budget, so you can’t afford to pay for poor service. The Denied Boarding Regulation initiative is designed to protect airline customers from losing money due to flight delays and cancellations. The scheme holds air travel providers accountable, facilitating payments for customers that spend money during travel slowdowns. If you have confirmed booking for travel with an EU airline, or if you’re ticketed to fly from an EU airport, you are entitled to compensation, when your airline fails to provide timely service. To qualify, you must be present at least 45 minutes before your scheduled departure time, with ample time to check-in and clear security screening. Unanticipated weather delays aside, if you’re kept waiting more than two hours, the airline must reimburse related expenses. Flight delays and cancelations can cause a ripple effect, interfering with your travel itinerary. Connecting flights, accommodations, meals, and communications can all be affected when travel slowdowns arise, each adding to the cost of your excursion. Flight delay compensation ensures you’re reimbursed for actual expenses, when the airline is responsible for additional travel costs. England’s geographic position enables fast access to widespread leisure travel attractions. This list highlights a few unique favourites, which draw curious UK holidaymakers every year. If you choose an EU airline or travel to an EU destination, consider a flight delay compensation claim when delays arise.